A decade ago I loved playing orks for the conversions. Put da boyz away for a long time and only brought them out again this year. Last night decided to give another shot at using all those old tank bitz to build a battlewagon. Not sure if the job's a good 'un, but I wanted to share! 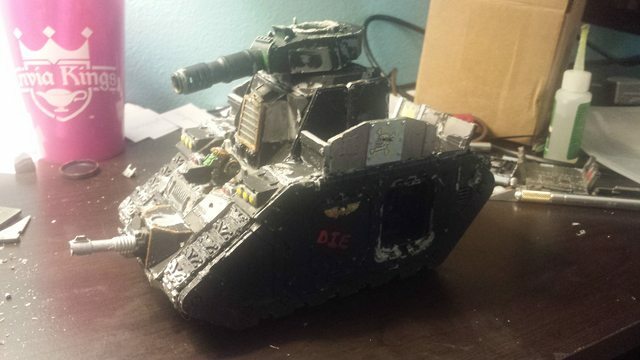 As you can see, the chassis is an old land raider body (Crusader to be exact). 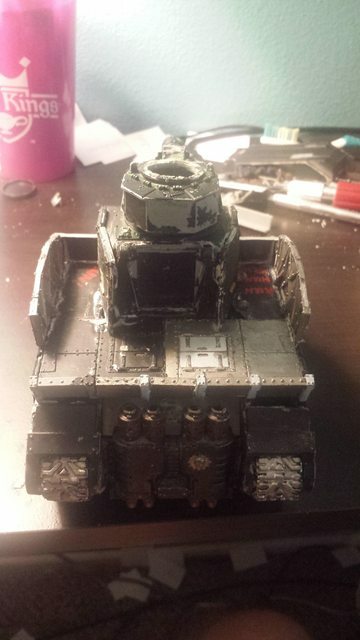 The killkannon mounted on top is a carved up leman russ chassis. Used the front lascannon under the driver (probably going to represent zzap gun). I'm going to give the driver beakie shoulder pads and a bit more plating around him, but he will still be exposed (which I felt was pretty Orky). But I play deffskullz, so his luck should keep him alive! The back platform is just a couple of old school trukk beds cut up. I also included a portal door under the killkannon. I'm going to throw on some boyz with big shootaz in the corners and turret, but otherwise I don't have much more to add. Ideas? If you like what I built, I'll post more pics as I paint the thing. "There's nothing like the sound of Dakka in the morning!" Yes, more pics, it looks good. If I could make a suggestion though - angle the battle cannon upwards,it looks really droopy and sad. I guess it's current configuration is more realistic for shooting troops on the ground, but I think it would look lots more imposing angled up. Also, taking photos against the light as you have makes it really difficult to see the fine detail, especially for us phone browsers. Can you take your piccies from the other side of the bitzwagon next time? But yeah, this is a great conversion!